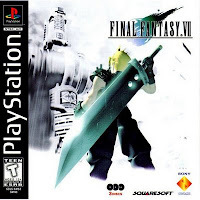 Final Fantasy VII has been available on PSN for a couple weeks now and has met with great success, selling over 100,000 digital copies. Of course, who wouldn't have anticipated the success of one of the greatest games of all time (as most people would agree that FF7 is). Simply put, a lot of people love this game. I am one of these people. Keeping with my habitual lateness, I didn't actual play this game until about 7 years after its release, while my friends were playing Final Fantasy X. And for me, the game held up pretty well, even offering up a few "holy crap" moments. All these years later, I am taking on Final Fantasy VII a second time, this time with the added novelty of being able to play it on the go. The game looks pretty darn good on a PSP screen. I have to say, Final Fantasy VII has one of my favorite opening segments. The game embarks with an awesome (for the time) movie sequence that leads right into your mission in the Mako Reactor, both of which help to kick the adventure off with a real sense of conflict. It's Avalanche versus the obviously oppressive Shinra Corporation (a.k.a. "The Man"!). This joyous kick-off (along with the joy of leveling-up when leveling-up is at its easiest, a battle system that won't have yet reached its expiration date, and the feeling that you have a grand adventure ahead of you) easily carried me through the first couple terrorist missions. And yet, this excitement came to a screeching halt when Cloud falls a couple hundred feet through the roof of a church and somehow survives. All of the sudden, the party that I'd been powering up was split up, and I was forced to move forward with Aeris, who (in spite of her charm) is a burden to work with. To make matters worse, shortly after having my party gimped, I was forced to set out on a fetch quest to obtain the artifacts necessary to dress Cloud like a woman. Not fun! I blasted through that as quickly as possible to the point where the plot really starts to pick up after you escape Don Corneo's bedroom. The Shinra Corporation had the audacity to drop a section of upper-Midgar on top of one of the slums, ultimately resulting in the deaths of countless innocent NPCs. And that brings me to where I am currently in the game. I'm approaching the top floor of Shinra Headquarters, where my thus-far-black-and-white fight against Shinra is sure to end with the introduction of some grey area.